"I Know This Much is True." To research the role, Mark wanted to meet with someone living with schizophrenia in the Mid-Hudson region where the series is being filmed. NAMI-NYS's Tina Lee, who formally ran the Mid-Hudson affiliate, set-up a meeting between Mark and NAMI Mid-Hudson member Richard Wiedeman. Richard met with Mark for two hours and told his story and detailed his recovery. This is just another example of the impact NAMI-NYS members can make by telling our stories. Home is an inspiring independent film about mental illness: serious, warm, intense and humorous. It has won the Entertainment Industries Council’s PRISM Award for 2014 for its portrayal of a person living with mental illness and was a nominee for Outstanding Director in a Motion Picture at the NAACP’s Image Awards. Many of the faces in the film are familiar from such television series as HBO’s “The Wire,” “NYPD Blue,” “The Good Wife” and “Blue Bloods” and movies like Terminator 2 and Blackhawk Down. 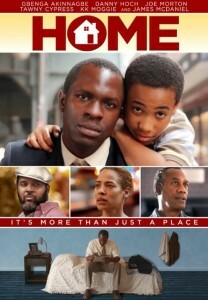 The film was recently released on DVD and Video-on-Demand; more information about the film can be found online at www.homethefilm.com. The story revolves around Jack Hall, played by Gbenga Akinnagbe (“The Wire”), who has schizophrenia and lives in a New York City group home. Hall has a job as a messenger and is trying to gain independence by moving into his own apartment; in doing so, he is hoping to salvage his relationship with his young son, reestablish his life and try to achieve some sense of normalcy. Jack’s psychiatrist must approve his discharge, but doesn’t believe he is ready. Other residents of the group home have their own differing opinions as to whether Jack is ready to live independently out in the world. I’ve always been attracted to films that show regular people who we might not be used to seeing on screen. These are people we might walk by on the street, taking for granted all that they might be going through and might have to offer the world. I like stories with challenges for characters that might seem small to most of us—such as getting a new job, asking a person out for a date, finding an apartment—that are no less than life or death for them. As for the mental illness aspect, my parents were social workers. My mother was a school social worker with the NYC Board of Education, and my father ran a mental health clinic in Brooklyn back in the ’70s and ’80s. So perhaps that’s where the seed was planted. I also have been very aware of the media’s depiction of people with mental illness as usually one of two things: psycho killers or jokes. I was excited about portraying a group of people to help break down that stereotype. The film has an incredibly talented cast. How did you recruit them? Did they research and study for their roles involving mental illness in any special way? I was blessed. Many great actors wanted to get involved for practically no money. They just did it for the love of the project. It was a lot of work to cast the “group.” I wanted the right balance of pathos and humor, and I took ethnicity and age into account, but the most important thing was to get a cast who were fantastic actors and who were real, believable and truthful. I was very conscious of the potential criticism the film could receive if I screwed up the mental health depictions. It would have gone against a lot of what the film stood for in my mind. I needed some humor and a lot of humanity, and thankfully the cast I assembled did this beautifully. They played their characters with love and dignity. Some had prior experience with mental illness, both with themselves and those around them. Some of that was discussed when talking about their characters during rehearsals. I also had an amazing technical advisor, a psychiatric nurse, who worked with me to come up with diagnoses for the entire cast. Each person had a very detailed backstory, even though it was typically not an overt part of the film. Not one diagnosis is spoken out loud in the film. It was important to me to not label them. I wanted the audience to get to know them as they act and behave as opposed to by some illness that someone says they have, with all of the preconceptions and misconceptions that this often breeds. You have said that Home is a story that everyone should be able to relate to. Did you intend it as a metaphor about life in general, not just a story about mental illness? Absolutely. Jack’s story in Home is very specific, but we can all relate to having a goal, facing obstacles and doubts and trying to overcome them. Sometimes we fail, sometimes we succeed, but the victory is in trying. I often laugh about the parallels between making this film and Jack’s goal of simply getting an apartment. The true obstacle is other people’s doubts. What was the most difficult challenge in making the film? Not having money to make it! (Laughter.) But in a way, that helped because everyone involved, cast and crew—everyone—did it because they simply wanted to help tell this story. I’ll always be grateful to them. Was there a moving “real-life moment” in making it? Real-life moments have come in people’s reactions to the film. When we were struggling to find distribution and get the film noticed, and seeing the reactions of the audiences really kept me going—knowing that we had a very good movie that people should see. The DVD’s bonus features include videos from NAMI NYC Metro. Have you had other involvement with NAMI? I joined NAMI many years ago while I was researching a TV show about mental health workers. That’s when I first became aware of NAMI. I like their model of family involvement in the treatment process. We also handed out green ribbons at this year’s NAMIWalk in New York. One of the most exciting things about Home is that we’re really trying to use whatever attention it gets to help give mental health groups a platform for them to be heard by those who might normally turn a deaf ear. I want to thank my whole cast and crew for their continued hard work and support. And thank you, NAMI, for taking the time to talk about Home. It’s really hard for us little guys out here in the world of independent films to get notice and support, so I appreciate it greatly! Frankie & Alice, which was released April 4, 2014 by Lionsgate and Codeblack Films. explains in the NAMI interview. For full interview, please see www.nami.org/berryinterview. importance of compassion for others [and] helps educate the public." "My main message is one of hope." 35 years as a psychiatric nurse for the Department of Veterans Affairs (VA). "Stories of mental illness have been a part of my life and on my radar for a long time." mental illness and placed a spotlight on a topic still not often openly discussed. Helping introduce legislation, meeting with Vice President Joe Biden and sharing his son’s own history with bipolar disorder— with his son Matthew at his side—Russell has taken the lead in raising awareness. In regards to the film, his directing creates scenes that, while fictional, appear to rip actual details out of the lives of those who have experienced mental illness themselves. Yes, the feverish story does come together nicely in the end for all those involved, which is not always the case for people living with bipolar disorder or other mental illnesses, but it accomplishes what many movies are supposed to do: provide a break from our own lives, make a connection and offer a little hope. NAMI was fortunate enough to be able to speak with Russell about the making of the film, his personal connection with bipolar disorder and his advocacy efforts so far. You had been working on the script for Silver Linings Playbook for five years before you had the final version for the movie. What were you able to accomplish in the last version that you don’t think you were able to in the first? Many things. The script evolved the entire five years. At first, it was a rough adaptation of Matthew Quick’s novel, but then there were many questions I had to answer over time, such as how hard-hit this main character should be with his issues, because in the book he’s been away for four years. I didn’t know how to do that exactly. But I do know people who have been hospitalized for short periods, sometimes repeatedly. It was a process of defining exactly what Pat Solatano’s [played by Bradley Cooper] issues were and how they were visible and when. Also, there was the evolution of the father character, Pat Sr. [Robert De Niro], into a bookmaker from someone who in the book was an obsessive fan. Then it was deciding how the father was superstitious and had OCD. At some point I made The Fighter, which I was very grateful to get, and in the making of that movie I focused my affection for the specific enchantment of neighborhood worlds, in that case Lowell, Mass., and in Silver Linings Playbook, Upper Darby or Lower Merion, Pa. This became as interesting to me as the story. And the romance became very important to me, and how to back into that via the secret deal with the book, because in the novel, the Nikki [Pat Solatano’s wife] incident is withheld until near the end, and I did not want to use it that way; I preferred to give it up sooner, because it’s not so much about that incident as it is how he’s picking himself back up and putting his life back together in an excelsior fashion. Also in the book, his upward-attitude strategy was expressed through his love of movies and going over them in his mind. One film in particular was Rocky, but after I did The Fighter that seemed like not the best idea, and also I wasn’t sure about using movies inside of a movie. that can sometimes develop when a member of a family has a mental illness. How did the importance of family influence the way you chose to portray those relationships and mental illness? From my own experience, I know what many families go through and how much everyone has to step up. And how some people can be in denial of what’s happening, or not want to deal with it. In speaking about the movie, you and your son have mentioned his own personal experiences with a mood disorder. What was his reaction after he had seen the final product? He said the film makes him feel proud and that it is inspiring. It was a remarkable opportunity to make a film about experiences that we, and many other families, have lived. There is something healing in storytelling and inclusion. The film is filled with painful experiences but is also filled with love and humor. How did you find and create the balance between the two sides? have an impact on the production of the film? Absolutely—the film’s heart was informed by personal care and experience. It was all an atmosphere of embracing the family and the people in the family no matter what their issues, and all of it being dealt with rather than shunned. You and Bradley Cooper recently met with Vice President Joe Biden in February to discuss the importance of addressing the topic of mental health in America. What was that conversation like? defunded. It was a gift that Mr. Biden gave his time and blessings to the open embrace of those who deal with mood disorders and their families. You worked with a group of senators to introduce the Excellence in Mental Health Act, a bill that would strengthen treatment options at the community level. Do you have any plans to continue to advocate and raise awareness for mental illness in the future? Yes; it never stops. Just helping my own family means a constant dialog about how to get the right support, the right resources, the right set-ups, living situations, aides, attitudes. I know so many families who will deal with these questions for the rest of our lives. I can see what is needed: There is a need for so many more schools that can meet these needs, or resources within existing schools. And I can see the exact bridge programs needed to help the transition from high school into either college, or other programs, or a safe environment of work and learning and building a community. What do you hope people take away from the film about mental illness? Mostly, I want people to come out feeling that it was a good movie. Part of that is feeling less afraid of talking about and dealing with and being warm and human about mental illness challenges—and wanting to do more. Bradley Cooper’s character in the movie tries to “take all this negativity and use it as fuel and find the silver lining.” How do you find your silver lining? Work is very good. It’s important to be grateful for it and commit to it no matter how difficult. But it’s the people around me and a good meal in a home or a neighborhood restaurant. These are things I love. Baseball games, too.